A tumultuous plane of wild mana, unstable weather, and floating terrain, Zendikar is a world of incomparable natural beauty and danger. The plane is wracked by volatile seismic movements known as “the Roil.” Violent shifts in the landscape make life precarious, unpredictable, and full of adventure. Rivers cascaded down from above the skyline. Craggy peaks lurch to crush those who would scale their heights. Lush forests and murky swamps grow over upturned ruins hiding ancient secrets. Massive stone formations known as hedrons, the ancient handiwork of the Planeswalkers Ugin, Sorin, and Nahiri the Lithomancer, remain as a reminder of calmer days on the plane. Days before the Eldrazi escaped. The Eldrazi were three inscrutable entities of the Blind Eternities, able to travel between planes to devour worlds. Unable to defeat the titans, the ancient Planeswalkers used the hedrons to lure, contain, and immobilize them. They remained trapped in stasis and hidden for millennia until younger Planeswalkers inadvertently released them. Freed from their imprisonment, the Eldrazi titans summoned their spawn and spread throughout the plane, consuming two of Zendikar's seven continents and leaving chalk deserts and warped Escher-scapes in their wake. The Zendikari who endured the destruction adapted and built alliances; kor and merfolk, elves and humans, even the proud and deadly vampire families of Guul Draz. With the help of the four founding Planeswalkers of the Gatewatch – Gideon Jura, Nissa Revane, Jace Beleren, and Chandra Nalaar – the titans Ulamog and Kozilek were destroyed near the city of Sea Gate. Zendikar struggles to recover, with vast areas depopulated and devastated. Akiri once guided a kor band on Zendikar, but she struck out on her own when an Eldrazi attack killed her comrades. Now she uses her line-slinging expertise to safeguard travelers from Ulamog. Death won't catch Akiri off-guard—she believes preparation and self-reliance are the keys to survival in a hostile world, and they've kept her alive so far. A Zendikar native, Bruse Tarl was once a humble nomadic herder known for the colorful manner in which he motivated his oxen. When swarms of Eldrazi monsters spread across the continent of Akoum, threatening to annihilate his caravan, Bruse organized a resistance. After dozens of battles, the fame of his feats against the Eldrazi is only exceeded by the creativity of the insults he hurls at them. This vampire sage spent years searching for the Eye of Ugin, trying to save his people. When Chandra Nalaar showed him the map, he offered to guide her, fully intending to betray her. Instead, Jace tricked him—only to find that Chandra and Sarkhan had beaten them both to the prize. Unspeaking creatures of the Blind Eternities, the Eldrazi’s existence is marked only by their constant consumption of all energy and matter around them. Emrakul is the largest of the three Eldrazi titans, able to annihilate anyone in the vicinity by his presence alone. Kozilek has a multitude of eye sprouts across his body. Thus, he came to represent mental destruction and the puzzle of insanity. Like the other Eldrazi titans, Kozilek’s motivations are shrouded in mystery. This Eldrazi titan travels across Zendikar on writhing, massive tentacles. Its facial features are covered by a thick bony plate. The Eldrazi may have senses beyond mortal comprehension, but this complete lack of understanding hinders any attempt at communication, reasoning, or peace with their kind. Life on the Teeth of Akoum is treacherous, but manageable. Rock slides on this unstable terrain are perhaps the biggest threat. Clinging to what little shelter there is, humans survive by rallying together, protecting each other, and finding the quickest paths to safety. The homeland of Gatewatch member Nissa Revane, the jungles of Bala Ged were defined by massive vegetation. Since the rising of the Eldrazi Ulamog, all life in Bala Ged has been devoured. Aside from a hidden cave containing Khalni Heart, the continent has been reduced to an endless desert of fine dust. Upon discovering that certain healing spells were amplified by the hedrons here, humans were eager to build a settlement nearby. They pass along any information they gain about this phenomenon, diligently recording and storing all of their findings at the Lighthouse of Sea Gate. 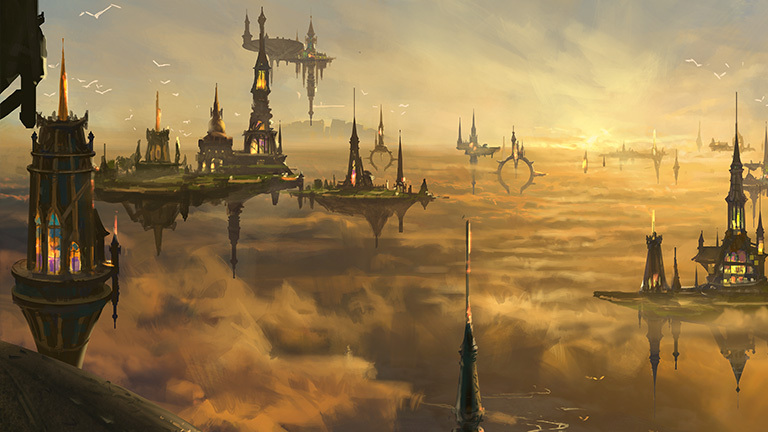 Tazeem and the city of Sea Gate were the site of the final battles against Ulamog and Kozilek. Sieged, taken, then reclaimed by Zendikari armies and the nascent Gatewatch, Sea Gate is now known for a grove of trees planted nearby by Nissa Revane; the last known examples of Bala Ged’s lost jungles. Once released from their prison inside Zendikar, the three Eldrazi titans spawned many lesser Eldrazi, which consumed all energy and matter as they expanded across Zendikar. Despite the defeat of the titans, many of their bizarre and vicious creations still wander the plane, seeking only to devour. The vampires of Zendikar hid a terrible secret: ages ago, they were thralls of the Eldrazi. When their masters returned, many fell back under their sway – either as a conscious decision or through magical compulsion. Others, led by Bloodchief Drana, fled to Tazeem, where they joined the resistance armies under General Tazri and Gideon Jura. Curious and analytical, the merfolk of Zendikar reside in scattered enclaves throughout the plane. Merfolk long believed that three powerful figures watched over the plane: Emeria (sky), Ula (water), and Cosi (land). In fact, these deities were based on dim memories of the three Eldrazi titans Emrakul, Ulamog, and Kozilek. Goblins have a deep fascination with trinkets and artifacts. They often weave their discoveries into their gear, which they display with pride, regardless of its actual power or importance. All Zendikar goblins belong to one of the three major tribes: the Tuktuk, Lavastep, or Grotag. Most elves lived in the treetops of Ondu and Bela Ged. When the Eldrazi were released, the nations of Bala Ged – the Joraga and Mul Daya – were virtually exterminated. Some survivors joined the Tajuru nation in Ondu; others continue to fight alone against the remaining Eldrazi spawn. These graceful, fearless creatures adventure across the floating hedrons, looking for unknown treasures. Using their hooks and lines to transverse aerial gaps and ensnare foes, they make excellent guides and protectors. Return to the wild plane of Zendikar, where the monstrous Eldrazi threaten the entire world with destruction. The plane's inhabitants, and even the land itself, stand united to oppose them. Ancient forces are awakening, causing this dangerous world to become even more perilous. This second set in the Zendikar block features the new game mechanic Multikicker, introduces a new version of the Planeswalker Jace Beleren, and expands on the Allies, Landfall, Traps, and Quests mechanics. Chandra has rescued her Planeswalker allies from Ob Nixilis, but Zendikar still seems on the verge of collapse. Nothing can stand before the might of Kozilek, but that won't stop Tazri from trying.